Cook the manicotti in plenty of water and salt as per the instructions on the box. Drain and set aside. Meanwhile prepare the filling. For the filling, cook the spinach for 10 minutes in the microwave. Remove, and drain the spinach. Pour the oil in a nonstick sauce pan. When hot, add the garlic and fry for 30 seconds. Turn down the heat, and then add the onions. Fry them until they are transparent. Next add the spinach, seasonings, black pepper, and salt. Cover and cook on medium heat for 10 minutes. Turn off the heat and cool. Mix the spinach with the ricotta - blend them well. Use this as a filling for the manicotti shells. 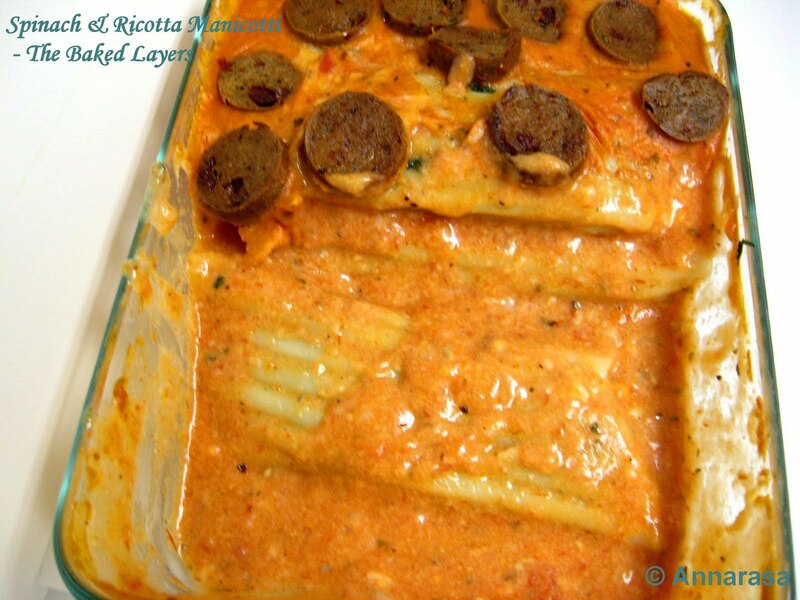 Spray an oven proof dish with a little olive oil, and arrange the stuffed manicotti. Cover completely with the pasta sauce. Cook in the oven at 350 degrees for around 20 minutes. 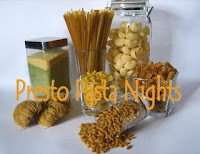 It also goes to Presto Pasta Nights #76 , hosted this week by Ruth herself at Once Upon a Feast!! I read a new recipe in a magazine where the author used boiled and mashed chick peas as filling. wow!how many different ways to serve manicotti! 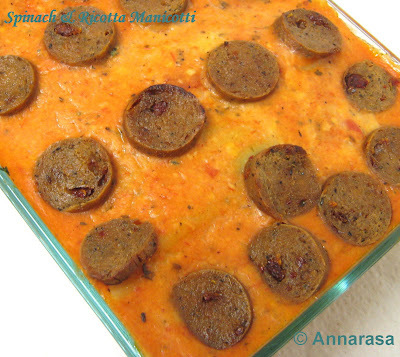 First time I tasted manicotti when I was in hospital after my delivery. I was blown away with the taste. I am not sure if they used eggs but that included ricotta and cottage cheese. The dish is looking tempting. Will try it soon. It really is not necc to include eggs for this dish since ricotta also helps to bind. I love manicotti and try lots of puree as filling. Thanks for sending me this beautiful entry for AWED. It does look fantastic. Thanks for sharing with Presto Pasta Nights.